Updated with final photo entry and a diorama shot! Check out my Flickr photostream for more pics! I loves it! Where'd the blaster end up, though? Hey, cool. I like how you went with a balloon version of the speeder bike. It's a great design and surprisingly compact. Good job! Give the pilot another helmet maybe this or this one. The current one looks to new. The front of the chassis (the one with the silver plate round 1x1 on it) looks a little bit ... maybe plain. You could ad some detail with this item. I really like the blimp idea. seconded! Great idea you've got started here. Thirded! It's a really great idea. I agree with Moppe about the changes, the front of the body is a bit too bulky to my taste. You must, however, be careful if you'll alter it; making it too sleek might be as bad to the steampunk-look - if not worse, one could say - as bulkiness. Apart from these things, it's awesome. I want a full-sized one of those for my driveway. It looks like a lot of fun to drive. Terrific work, I hate to say it, but I like the Imperial Shuttle one the best so far, with the canvas type wings, but this is definately next best. @ Moppe, I did some searching and I actually found one of those helmets. Your right, it looks alot better now. I re-did my scout trooper a bit and I think the final result is pretty nice. 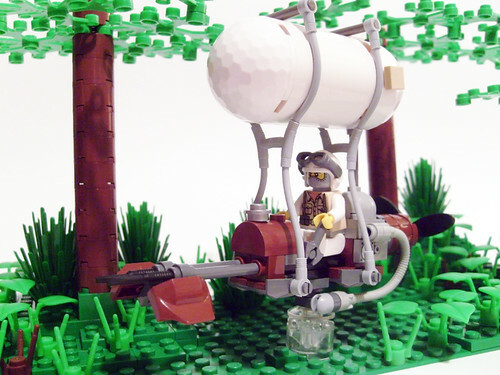 I am seeing alot of really great MOCs for this contest. The quality of the work all around is really high! Good luck to everyone! Much better. Very good now! Wow nice. It's easy to realise what it is. I like the ballon idea. This is Ingenious, if any of the small Mocs deserves a place this one does, The balloon was well incorporated, and you proved that a little can go a long way with a bit of thought. Great Job. I wanted to make this as small as possible and yet, still give it an appropriate amount of complexity. I also wanted to only use pieces in my collection. No Bricklink orders. I am pretty pleased with the results. This is a really nice MOC. I have exactly zero experience building in steampunk, but from an outsider's perspective I see this as a fantastic conversion of Star Wars into the steamy realms. � The color scheme works nicely with the "typical" browns and greys� the white balloon adds a nice bit of freshness as well. I know it's a small model, but I would've liked to see a bit more color blocking with, say, brown all on top and greys on the bottom to simulat a machine with a wooden cover or something similar. Of course that all depends on the pieces in your collection, as you said. Anywho, great colors and you convey the steamy feeling quite well. � I think one of the biggest pluses of your bike is that it actually seems like it could work. You don't have random gears and valves thrown on just to look steampunkish: it's obvious that the balloon lifts the bike, the boiler makes the propellor spin and that makes the bike go forward. It's simple, to the point, and perfectly executed. � The pilot is a bit outside what I would expect for a "standard" steampunk fig, but I think that's a good thing. His torso fits right in but his head and helmet are a bit more modern, almost steam-Victorian rather than the wood and metal of the rest of the bike. I actually really like his style� much like the balloon, not putting him in drab browns and black give a lighter, airier feel, perfect for the small craft. This is easily one of my favorites. You not only worked a SW vehicle into steampunk marvelously and did it with a minimum of pieces, but the ballooned speederbike concept is hard not to smile about. Well done. I actually like the pilot. I think it's a good steampunk version of the scout trooper. It is a scout trooper, right? Yup Jetman147, He is a scout trooper. According to George Lucas white is the perfect camouflage for a forest environment. 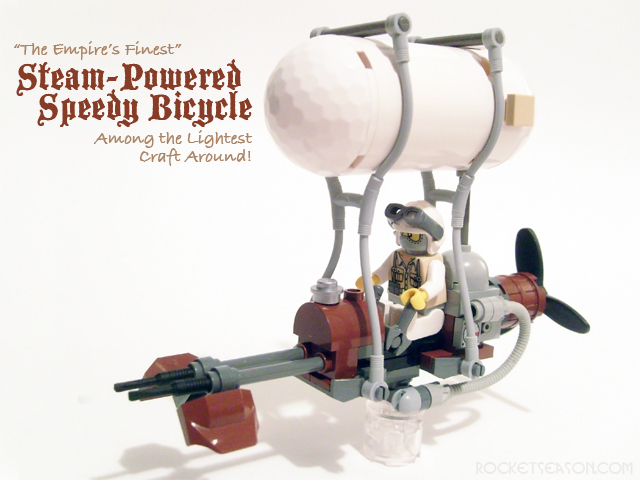 This is a really good steam speeder bike. In the contest I like the entrys with their own take on the steampunk the best. Making it this small do not allow for very much random detail so the steampunk has to come from the over all feeling of it. 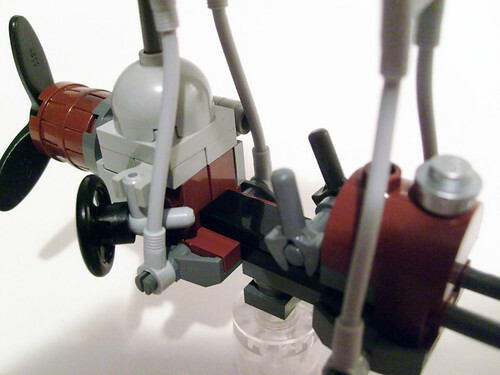 I think the simplicity of this bike, the balloon and the relation to the source vehicle make this a great little moc for this theme.